As much as I love Summer, I can’t help but force Fall a bit. I’m that girl sweating to death in boots and a sweater in August because I just can’t wait! Since I was a little girl buying new Fall clothing has brought me maybe an unhealthy amount of joy. In fact, I think it was the Persistence of Fall 1998 that eventually prompted my mom to insist that I start earning my own money for clothes (I blame Doc Martens.) So since I was 12, it not only became a time of fawning over chunky knits, but also hunt for the fashion I craved at prices I could afford. 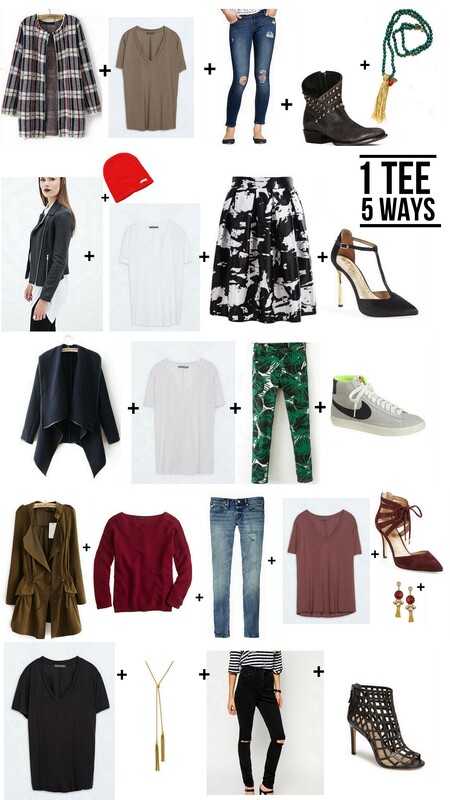 All of these things have brought me to today’s Fryday: 5 Ways I’ll be Wearing My Perfect Tee this Fall! I spotted the Urban Soft T from Zara earlier this Spring and was able to buy one before they sold out. Luckily they’re back! And yes, I bought all 5 colors. That’s when you know it’s serious. There’s a few investments throughout, but mostly they’re totally affordable. In TAN: With a plaid over coat, distressed jeans both $25 (I’ve been ripping them all the way to the side seams and taking an inch or two off the centers with this Pummice Wand (it makes the distressing look natural and not like an at-home job) for an extra dramatic look! Paired with my favorite tough-guy boots by Matisse $265 and a Tassel necklace $40. In OATMEAL with a big collared wrap jacket $35, patterned pants $15 and classic sneakers $100. I love the Nike Mid Blazer because it’s actually flattering on a woman’s leg! Or in DUSTY PINK: I sort of love the look of a monochromatic outfit. Repeating the same color in different intensities creates a little drama and you can’t beat burgundy for Fall. With a little peek of this tee under this Jcrew sweater (25% off) makes it feel less stuffy. This jacket $31 is so great too, because you can cinch it like a parka or let it hang loose and open. Oh and hey tassel earrings $14, I obviously can’t get enough of you. With Sam Edelman’s gorgeous heels, kicking myself I didn’t scoop these up during the Nordstrom Sale, but they’d be perfect with Gap’s Always Skinny skimmer jean! These ones are half off $39! In WHITE: I love that full skirts $15 are making a comeback! So much more forgiving than their pencil counterpart. Also loving the gold heel detail of these t-straps. $175 It might be getting a little too cute for me though, so I’m topping mine with a faux leather jacket $42, and a beanie in a pop color $15! Neff makes every color under the sun! In CHARCOAL: this is the color I’ve had all Summer and it’s perfectly faded but has held it’s shape so well! More distressed jeans $67, more tassels. It’s an unbeatable combo in my book! Sort of dying over these Via Spiga $165 YSL cage bootie knock-offs, but also, pass the flats. Do you have any pieces you’re excited about for Fall? I don’t need a bouquet of pencils, Tom Hanks. Just buy me a cute coat. Happy Fall shopping, everyone! Curious, have you had much luck actually ordering from sheinside.com? I ordered a coat from there last year and it took 3 weeks to even ship and they were a nightmare to work with, almost not worth the great prices! I have a couple times and you’re right, it takes forever! But, I think it’s okay for certain times like buying outerwear where its not gonna be cold enough to wear it for awhile anyway and then I get something pretty unique for a great price! Ive been really impressed with the quality and haven’t had to do a return yet, but my friend says you just return to their Los Angeles office and they take care of overseas stuff which is nice! TOO CUTE! do you have all the pieces from sheinside? I’ve ordered from them once and I had mixed feelings…just wondering if it was just my own personal experience. Oh good to know thank you! What size of coats do you usually get, do you find they are true to size? Hey Emily! What size do you take in the zara v necks? Debating between the small and medium! Thanks!